Its not only the end of the year but also the end of the decade. 2000-2010 will be remembered as one of the decades where India underwent transformatory changes. The good part is that we all got an opportunity to lead and manage it while its still mild. The next decade will be much more virulent. Well this decade (2011-2020) will differentiate winners and losers at every stage. It will be much less tolerant. Mediocrity will have no place and will be much severely punished than the treatment it got so far. So tighten your seat belts, or should I say wear your space suits, the journey will be tough and exciting, certainly eventful. So how does one prepare for it? I believe that being 'agile' and 'adaptive' will be two most important qualities, that will allow you to succeed and survive the next decade. Well, doesn't it sound deja-vu, very Darwinian :-). I also believe that all those who will choose to be in constantly in 'learning' mode will reflect the above qualities and will have a better chance of getting it right. And this learning could take various forms - seeking right experiences, going back to college, books, seminars, peer discussions, teaching etc. 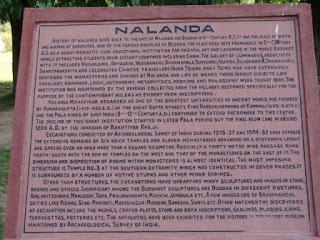 Towards end of 2010, I got an opportunity to visit 'Nalanda', a world heritage site. Its near Badagaon, a mofussil town near Patna, capital city of Bihar, a northern state of India. This place was a learning centre of excellence, site of worlds first residential university. It has a fascinating history running over centuries, between 6th-5th century BC and 5th century AD. At its peak, it housed 2,000 teachers and 10,000 students from all over the world. Can you think of subjects being taught ? Students came here to learn Logic, Grammar, Astronomy, Theology, Medicine, Metaphysics and Philosophy. The architecture and plan of the university is a marvel of sorts. The ruins even in present form looks stunning and speak volumes of the mind and inspiration behind this thought. The temples, the stupas (monastery sites ) along with residential sites - all of them so well laid out, so perfect. Spending hours at this ancient centre of higher learning, I felt so overwhelmed. I experienced a certain calmness and the same time felt very confident and energised. Couldn't have asked for a better 'learning' start for 2011. I extend my best wishes to one and all.